Josh Duhamel, Mario Lopez & More Live It Up at Elton John Farewell Concert! 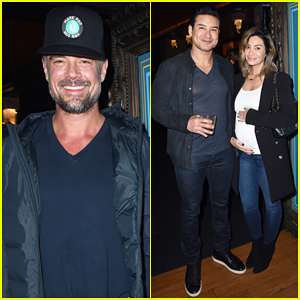 Josh Duhamel flashes a big smile while at the Sandals Resorts private event held at the Hyde Lounge in Staples Center as part of Elton John’s Farewell Concert on Wednesday (January 30) in Los Angeles. 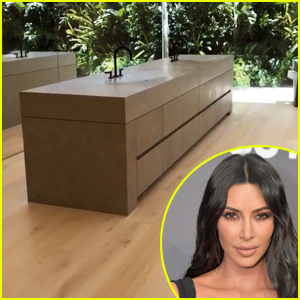 The 46-year-old actor was joined at the event by Mario Lopez and his pregnant wife Courtney Mazza, Victoria Justice, Josh Henderson and his girlfriend Oana Gregory, Candice King, Marcia Gay Harden, Ryan Rottman, Reeve Carney, Gilles Marini and his wife Carole, and Loni Love. Elton is on the road touring in the U.S until March before he heads out internationally in May. Earlier this month, Josh was spotted was spotted wearing a brace on his left arm as he stepped out in Brentwood. Olivia Munn, Jonathan Rhys Meyers & Family Step Out for 'A Time For Heroes' Festival! Jonathan Rhys Meyers flashes a big smile as he poses for a photo with his wife Mara Lane while attending The Elizabeth Glaser Pediatric AIDS Foundation’s Annual ‘A Time For Heroes’ Family Festival held at Smashbox Studios on Sunday (October 28) in Culver City, Calif. The 41-year-old actor and Mara were accompanied by their adorable 1-year-old baby boy Wolf, as well as hostess Olivia Munn, Ed Westwick, Sarah and Erin Foster, Gilles Marini and Randy Jackson. FYI: Olivia is wearing a Prabal Gurung dress, Edie Parker clutch and Jimmy Choo shoes. Heidi Klum slays the blue carpet as she arrives at the 2018 amfAR Gala on Thursday night (October 18) at the Wallis Annenberg Center for the Performing Arts in Beverly Hills, Calif. The 45-year-old America’s Got Talent judge looked so glam in a dramatic red gown and bright blue earrings as she joined Leslie Mann and Judd Apatow at the event. Other stars stepping out for the event included Rumer Willis, Gilles Marini, and Chris Tucker. FYI: Heidi is wearing a Zac Posen gown. 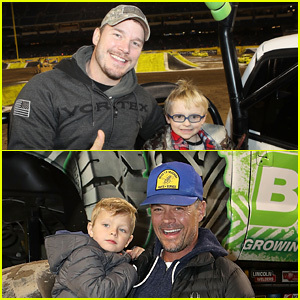 Chris Pratt & Josh Duhamel Hang with Their Kids at Monster Jam! Chris Pratt and Josh Duhamel brought their adorable sons to the Monster Jam celebrity event at Angel Stadium on Saturday (February 24) in Anaheim, Calif.
Josh was seen hanging with his four-year-old son with Fergie, Axl, and Chris was seen hanging with his five-year-old son with Anna Faris, Jack. Also in attendance were Nick Lachey and his son Camden, 5, Jaime Camil with his daughter Elena, 6, Clayne Crawford and his kids, Mark-Paul Gosselaar with his kids Michael, 14, and Dekker, 4, actor Gilles Marini, and Kendra Wilkinson and Hank Baskett with their kids Hank, 8, and Alijah, 3.